Are you looking for a recipe for delicious traditional Southern cornbread? 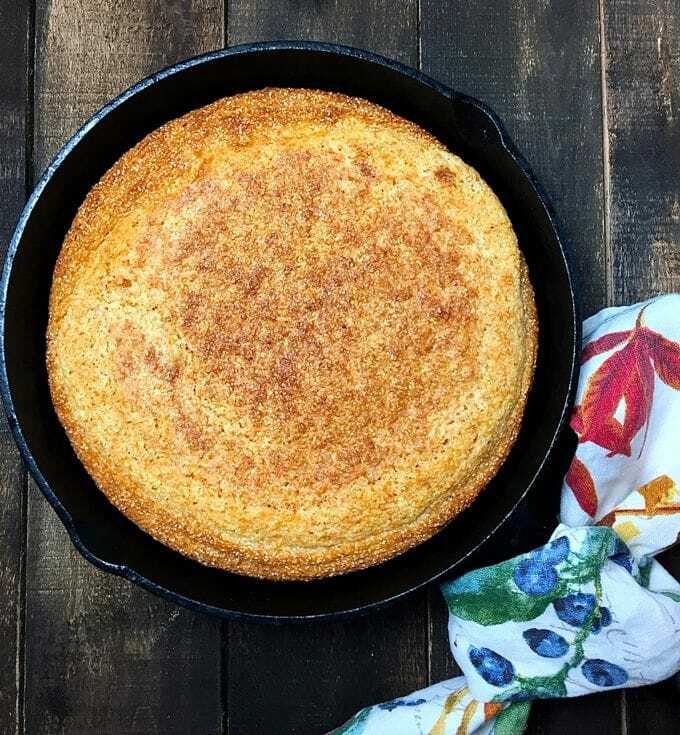 Old-Fashioned Southern Cornbread made in a cast iron skillet with buttermilk is a true Southern staple and a quick and easy gluten-free recipe! When I was growing up, my Mother made the most delicious cornbread, and we had it all the time. Every time I make her recipe it brings back many fond memories. I make my cornbread in the same cast iron pan she used, and I’m thrilled to be able to share her recipe with you. One of my favorite ways to enjoy cornbread is crumbling still hot and crusty cornbread into a tall glass of cold, tangy buttermilk. This may be an acquired taste, but if you have never had it this way, it’s something you really should try! True old-fashioned Southern cornbread doesn’t contain any sugar or flour for that matter which means it’s gluten-free. There are probably as many ways to prepare cornbread as there are varieties of corn and you will see lots of cornbread recipes that call for some flour and just as many that call for sugar as well. What is cornbread and what does it taste like? Cornbread is simply a type of bread which is often made with only cornmeal or cornmeal and flour. Most cornbread recipes also call for buttermilk. 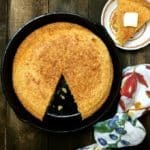 In the South, cornbread is usually baked in a cast iron skillet which gives it a crispy crust and how it tastes depends on the recipe, the type of cornmeal used, and whether sugar is added or not. To me cornbread tastes of cornfields on a warm summer day! What kind of cornmeal works best in cornbread? This recipe works best with, old-fashioned coarse stone-ground cornmeal. If you are in the Tallahassee area try Bumpy Road Farm Cornmeal or Bradley’s Stone Ground Cornmeal, which can be purchased at most farmers markets. 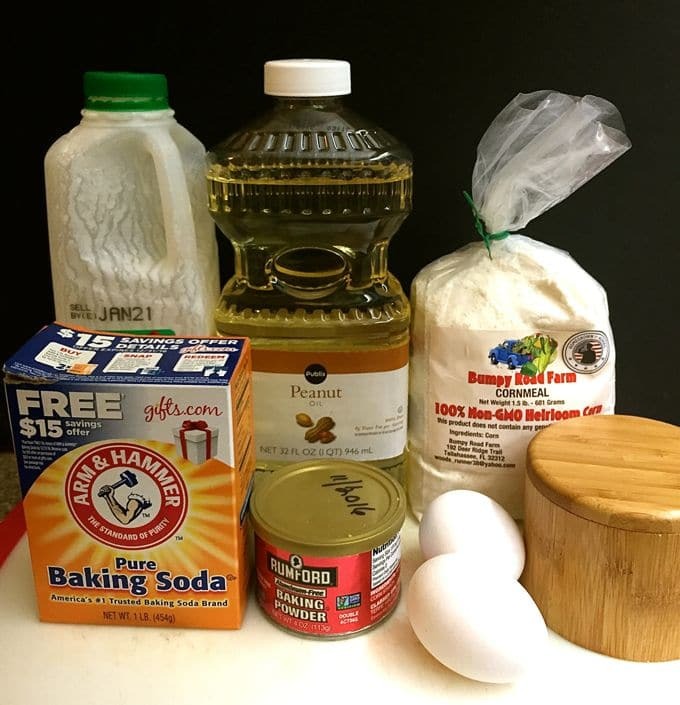 The other ingredients for this buttermilk cornbread recipe include vegetable oil or bacon grease, baking powder, baking soda, kosher salt, eggs, and buttermilk. For the best results and crispiest cornbread, you will also need a well-seasoned cast iron skillet. If you like cornbread, you might also like my Traditional Southern Style Cornbread and my spicy Mexican Jalapeno Cornbread. 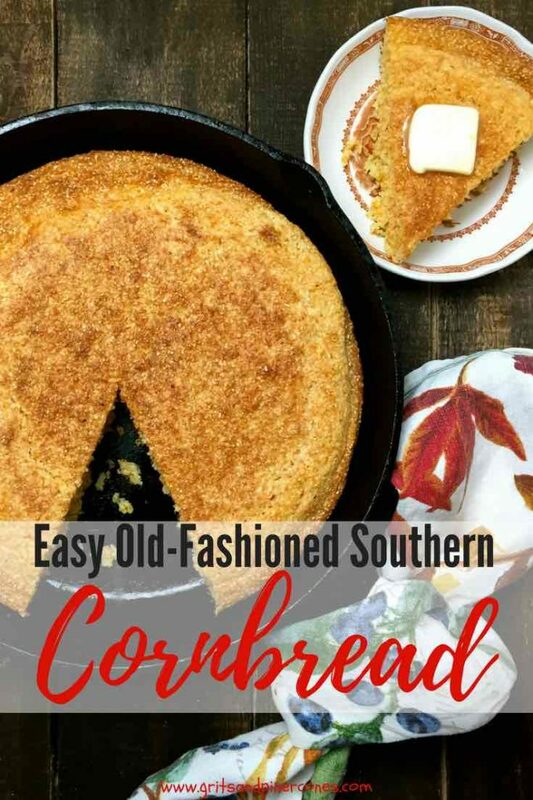 Traditional Southern Style Cornbread contains some flour and is not quite as dense as Old-Fashioned Cornbread and I think it works a little better in cornbread dressing recipes. 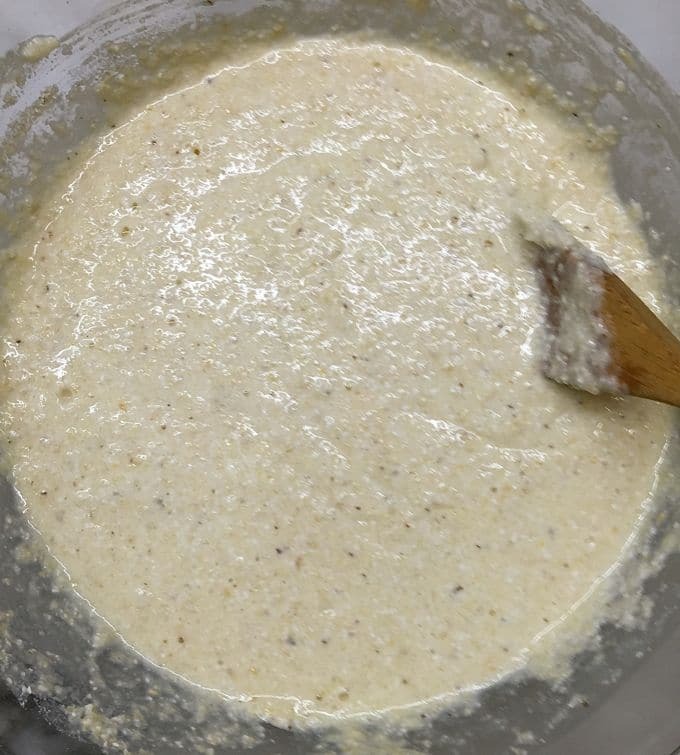 In fact, it’s perfect for my Traditional Southern Cornbread Dressing or my Make Ahead Cornbread Dressing with Sausage and Pecans. How to make Old-Fashioned Southern Cornbread from scratch! 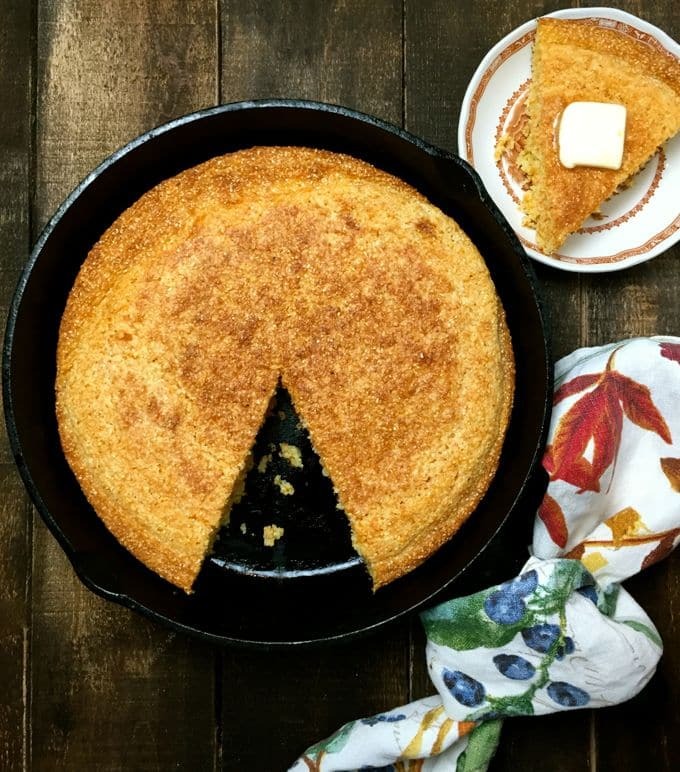 When you are ready to make Old-Fashioned Southern Cornbread, gather your ingredients and preheat the oven to 400 degrees F.
Add 2 Tbsp vegetable oil or bacon grease to the cast-iron skillet. Place the skillet in the oven for about 5-7 minutes to heat up. While the skillet is heating up, combine the cornmeal, baking powder, baking soda and salt in a large bowl. Add the eggs, buttermilk and 2 Tbsp vegetable oil or melted bacon grease to a smaller bowl and whisk until well combined. Add the liquid ingredients to the dry ingredients and mix until just combined. Do not over mix. Using a heavy-duty oven mitt or potholder, carefully remove the hot skillet from the oven. Tilt the skillet to make sure the bottom and sides are covered with oil. Immediately pour the cornbread batter into the skillet. You should hear a nice sizzle, and you will see the cornbread already start to rise. Place the skillet in the oven and bake for about 20-25 minutes, or until the cornbread is a deep golden brown and has pulled away from the sides slightly. To ensure it is done, insert a toothpick into the center. It should come out clean. Serve immediately. **Shared this recipe with Meal Plan Monday! If you liked the recipe above, please consider rating it and leaving a comment below. I love hearing from you! Also, follow me on Pinterest, Facebook, and Instagram. 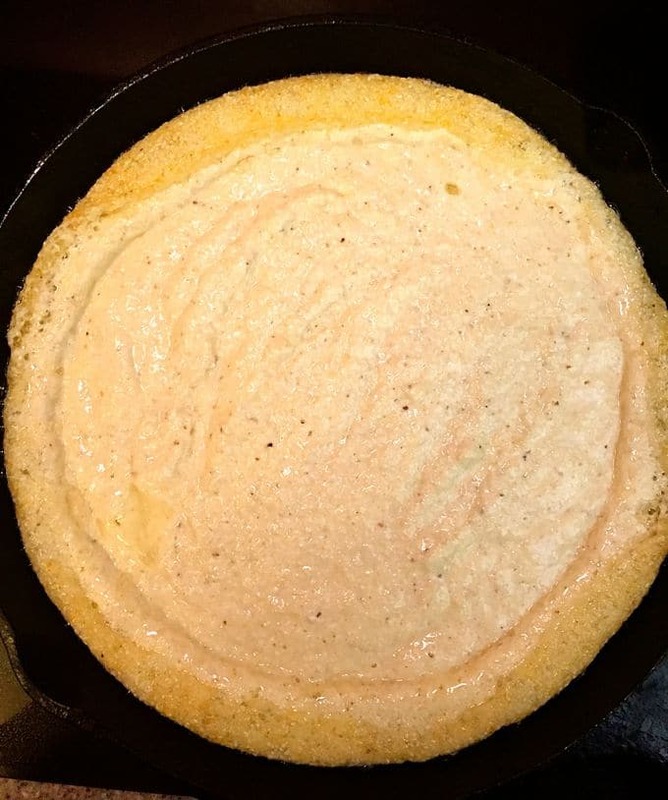 Old Fashioned Southern Cornbread made in a cast iron skillet with buttermilk is a true Southern staple and an easy and quick gluten-free recipe! Place the skillet in the oven and bake for about 20-25 minutes, or until the cornbread is a deep golden brown and has pulled away from the sides a little. To ensure it is done, insert a toothpick into the center. It should come out clean. Serve immediately. This recipe works best with, old-fashioned coarse stone-ground cornmeal. 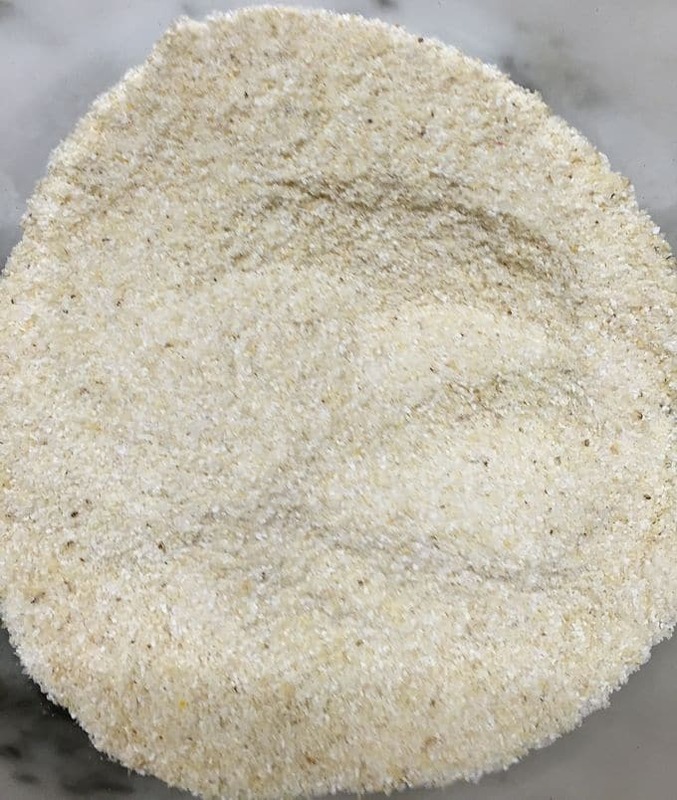 If you are in the Tallahassee area try Bumpy Road Farm Cornmeal or Bradley's Stone Ground Cornmeal, which can be purchased at most farmers markets. Nothing beats a well-seasoned cast iron skillet for the crispiest cornbread. This looks so good! I will have to try it. I have been searching for a more authentic Southern corn bread recipe. Thanks so much Kate! If you do try it please let me know what you think! Here it is! Searched the internet for real cornbread recipe and found it! No flour and no sugar. Thank you! So glad you were able to find it. Let me know how you like it! Thanks so much for letting me know Michelle! I’m so glad you and your family enjoyed it! What size skillet are you using? I am using a 10-inch cast iron skillet. 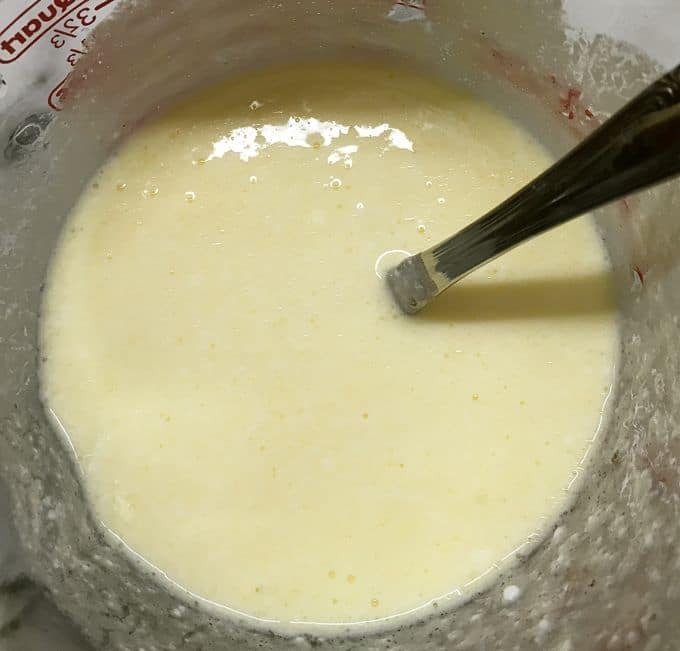 I was recently given some fresh stone ground cornmeal (and grits) in a couple of ziplock bags by my aunt made from corn that they’ve been growing here for years in north Florida and I needed a good recipe. Thank you for posting this. Best cornbread I have ever had! I’m so glad you liked the recipe and I’ll bet the fact that you have fresh homegrown and stone ground cornmeal contributed to some awesome cornbread. Thanks so much for sharing! This was awesome…made it on a whim with coarse yellow cornmeal and then made another with white cornmeal. Both came out great. Good, savory, buttery flavor with an airy, mealy crumb and a slightly crunchy exterior. Might add a bit more buttermilk next time, but it was a success with a group of 10 folks. Thanks for posting! Hi Carlos, I’m so glad you liked it and thanks so much for letting me know! I am so glad I found your website and yr recipe. It’s been several years since I’ve made this and one thing I now know for sure, only a varmit would put “flour” in a Southern Lady’s cornbread recipe. I do thank you so very much from the bottom of my heart for your hospitality…….yall take care, ya hear? Hey Laura, so glad you found me and so glad you enjoyed the cornbread recipe! It’s a staple around here! I was born, raised, & still live in south Alabama. Out of curiosity today, I was looking up recipes for cornbread. I’ve seen several today, that call for baking soda/powder/both. I have to say, that in my 38 years of living here, I’ve never once seen my mom or my grandmother put that in their cornbread. It’s always just been cornmeal, milk/buttermilk, & 1 egg. Hi Lisa, I’m sure their cornbread is delicious and I’ll have to try it that way next time I make some. When I make hoecakes, I don’t add any baking powder or soda either. Thanks so much for sharing! Hi Elizabeth, Thanks so much for leaving your comment. I am so happy you enjoyed the cornbread. And, I’m happy too that you adjusted the recipe so that your family would enjoy it. That’s the nice thing about most recipes is that they are easily tailored to each person’s taste. PS: I love all types of cornbread including sweet cornbread too! Thank you so much for printing this. I’m so glad you liked the recipe and thanks so much for dropping by and leaving a comment! Love the site. I love cornbread like my mom made, no flour, no sugar. Bought some stone ground corn meal but other family members make with sugar and flour. That is more like cake. Yes, cornbread should be eaten in a glass of buttermilk! I am going to try some of your other recipes. So glad to meet another lover of buttermilk and cornbread! Thanks so much for stopping by and I hope you enjoy the recipes! Hi John, I’ve never heard of substituting grits for the cornmeal. But I love grits and I love cornmeal so it has to be good! I’ll have to try it! This is the best cornbread recipe ever! It reminds me of the cornbread my grandmother used to make. I’ve been searching for a recipe without flour and sugar for a long time. I used regular cornmeal and bacon grease and cooked it in an iron skillet. I made it to use for dressing but when I sampled it it was so delicious my husband and I had to have a slice just plain. Thanks! Hi Ladonna, thank you so much for letting me know. I am so happy you and your husband enjoyed the cornbread! This is the best cornbread I’ve ever had! Thank you so much for your sweet comment! I’m so glad you like it! I knew when I saw the recipe it was going to be good. And oh BOY was it! The only thing I would change next time is to use Fine Ground instead of course. I was making this for my parents and sadly they were unable to eat the course (it was the texture) with their dentures. That is my fault I should have thought of that before hand. I am wondering however, if the fine ground would be the same measurement 2 c. or could I need to adjust? Thank you for sharing such a delicious tasting cornbread. Thanks so much for letting me know you liked the cornbread! Yes, you can substitute fine ground cornmeal. Just use the same amount. I hope your parents enjoy it too! I halved the recipe and used an 8 inch cast iron pan for my first batch. I found it had a bitter after taste. I did some research and found other people said the same thing for similar recipes. The second batch I baked using baking powder that was aluminum sulfate free like the old fashioned baking powder. That solved the bitter taste. I also like using left over cold grits or cornmeal mush in the recipe. Great recipe, gluten free and no added sugar. Hi Shawn, thank you so much for taking the time to leave a comment. That’s interesting about the baking powder. I have never noticed a bitter taste but I have always made the full recipe. I like that you have adjusted the recipe to your family’s tastes and the idea about adding leftover grits and mush is genius!